Who Will Pay for Trump Tax Cuts? President Donald Trump has just unveiled his tax reform plan. Though many financial analysts and tax experts say it lacks detail, one of its key, so-called reforms is cutting down the number of different tax rates from seven to just three: 15%, 25% and 35%. Guess who will pay the lowest tax rates? Why of course, it will be corporate America. It will be bankers and other major taxpayers, including companies owned by Trump and his family and his large corporate friends. Cutting the $39.6 tax rate now paid by pass-through entities to 15% will be a boon to high-income people who can use LLCs and other businesses to report their income, according to Joseph Rosenberg of the Tax Policy Center. Under Trump’s plan, corporations paying a 35% tax rate will also see their rate slashed to 15% if the president’s reforms are enacted. The cuts Trump promised for the middle-class are largely missing from his proposal, according to tax experts. Also missing is a clear understanding of how the revenue will be made up so as not to increase the deficit as Trump promised during his presidential campaign. Trump says that these huge tax cuts for the country’s highest taxpayers will generate more jobs and greater economic growth. We believe that trickle down economics have never worked, but the President seems convinced this time they will. 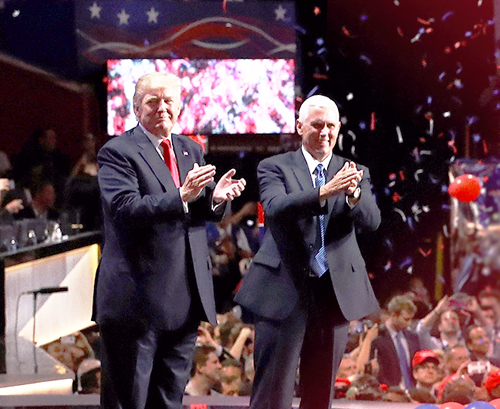 What the administration will actually do is add trillions of dollars to the nation’s deficit. How he plans to make up this gap makes us really nervous. It’s our feeling he will try to make up for the lost revenue by cutting services to the middle-class, the poor and seniors. So, right now, we recommend you hold on to your wallets. That role is shaped by each labor secretary’s needs, according to Seema Nanda, who was chief of staff through January 20 of this year. That includes reviewing documents that need the secretary’s signature, such as new regulations, reports to Congress, or letters. Several thousand protesters converged on City Hall today to voice their outrage over the inauguration of President Donald Trump. Two different groups — one starting in Boyle Heights and another near Staples Center — met up on Spring Street outside City Hall’s west entrance a little before 1 p.m.
“We organized this event to make sure to cross the bridge and protest Donald Trump,” Sol Marquez, an organizer with Centro CSO who marched with the Boyle Heights group, told City News Service. While marchers were vocal while chanting slogans like, “The people united must never be divided,” the protest was peaceful. Law enforcement presence at the scene was minimal, featuring several dozen officers and sheriff’s deputies in regular uniforms. Officer Tony Im with the Los Angeles Police Department’s Media Relations Section said no arrests had taken place anywhere in the city related to an inauguration protest. An officer on scene around 1 p.m. estimated that about 3,000 to 4,000 protesters were on Spring Street, but by 3 p.m. the size of the crowd had diminished, as had the size of the law enforcement presence. By 4:30 p.m. the protest was winding down and its organizers were packing up. The number of protesters was below the 10,000 predicted Thursday by some organizers. The morning rainstorm may have kept some at home, but not long after the protesters started to assemble the rain paused and the sun came out for a few minutes, causing many in the crowd to cheer. The Boyle Heights protest began at Mariachi Plaza before moving to the Federal Building and then City Hall. 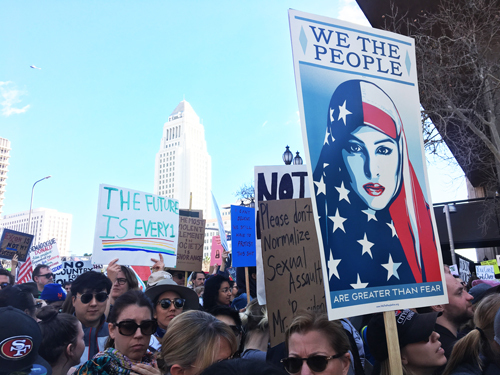 The protest that began near Staples Center was organized by more than 90 groups and began at Olympic Boulevard and Figueroa Street. 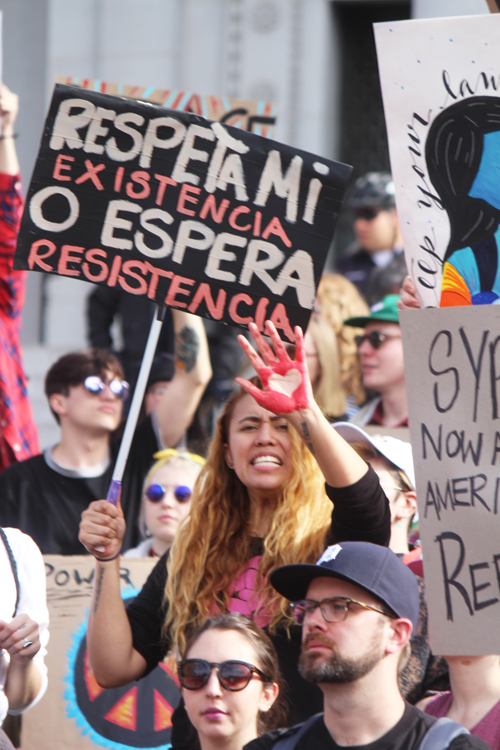 A common point of anger for the protesters at City Hall was Trump’s stated proposals to begin mass deportations of immigrants living in the country illegally. “We are working toward building a coalition that can defeat Trump’s agenda. 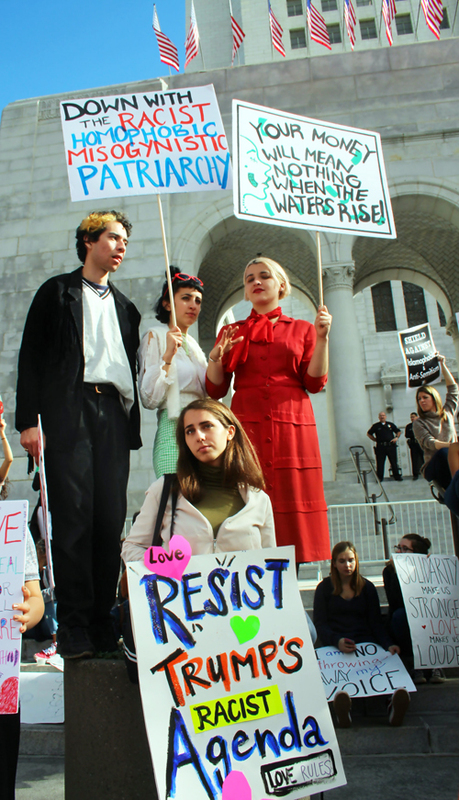 That means defending immigrant rights,” Lorenzo Osterheim, a student at Pasadena City College and member of Students for a Democratic Society, told CNS. 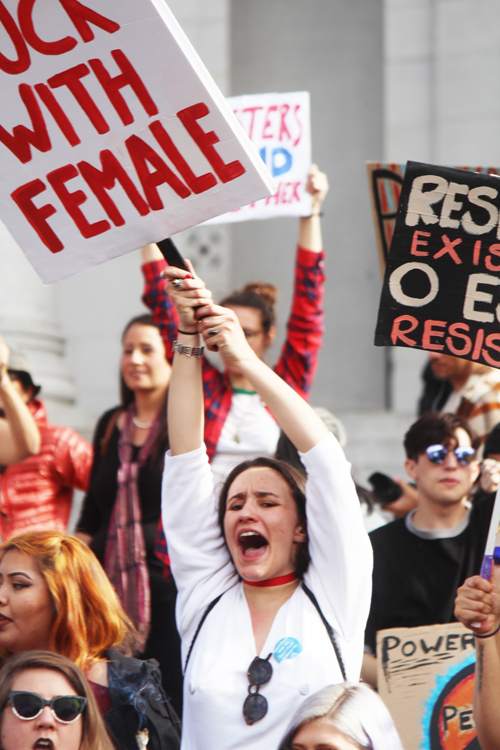 But there were other issues on the minds of protesters as well, including the hacking campaign allegedly orchestrated by the Russian government to help Trump during the election, his refusal to release his tax returns, his views on the environment and the crude audio recording that caught him bragging about sexually assaulting women. 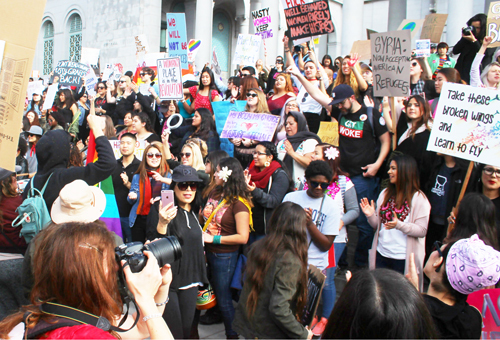 A large bus with a digital billboard on it that read “United Against Hate” was parked in front of the City Hall steps on Spring Street and a number of speakers addressed the crowd from the roof of the bus through a P.A. system. Skirmishes in Washington did turn violent today, with protesters breaking store windows and tear gas being used on some of them by police. 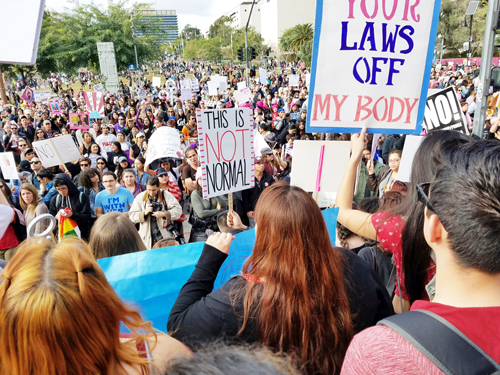 Other protests were held today across Los Angeles, including the “Caravan of Justice” in South Los Angeles that included several dozen groups, such as Black Lives Matter Los Angeles, Los Angeles Community Action Network and United Teachers Los Angeles. The “Caravan of Justice” began at Leimert Park at 9 a.m., with about 100 protesters boarding three busses to travel to other sites around the city before returning to Leimert Park at 2 p.m., said Jasmyne Cannick, who is doing media promotions for the protest. 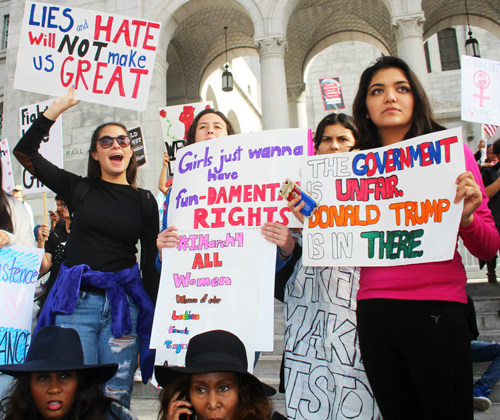 “The reason why these groups came together was because they did not feel like the protests that are taking place in downtown Los Angeles were being inclusive of people of color,” Cannick said. District officials said they developed lesson plans and activities for the day geared primarily to high school students, but available for students in all grades. The activities included “unity dances,” poster-making gatherings and “justice circles” to discuss the issues.